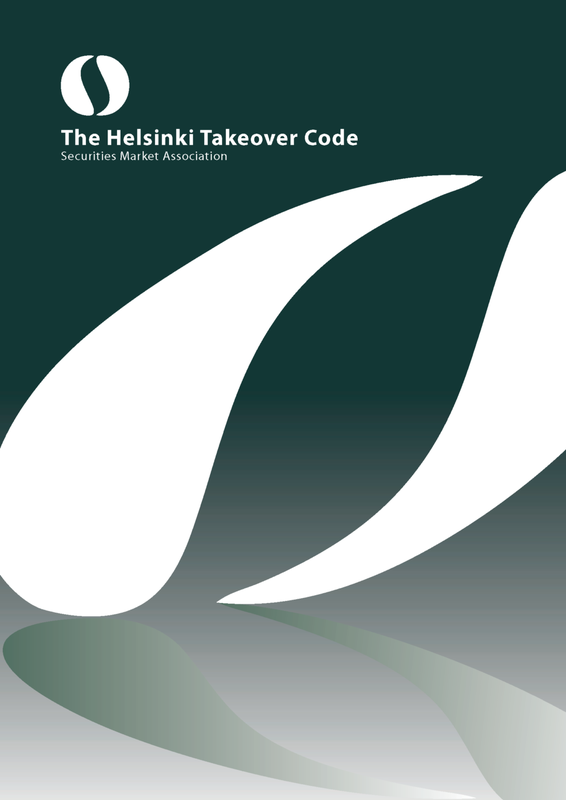 Securities Market Association has published a revised Helsinki Takeover Code, which has entered into force 1.1.2014. The new Helsinki Takeover Code contains recommendations regarding the actions applicable to public takeover bid. The Helsinki Takeover Code addresses questions and practices related to the actions of both the bidder and the target company as well as the management and shareholders of the target company. The Helsinki Takeover Code is relevant for all parties involved in a public takeover bid such as bidders, target companies and their advisors. The objective of the Helsinki Takeover Code is to standardise the procedures to be complied with in public takeover bids in Finland and in this way promote the legal protection of the parties in a takeover bid. The purpose of the Helsinki Takeover Code is also to promote good markets practice. In addition to the actual recommendations the Helsinki Takeover Code also brings together in its explanatory notes such procedures and best practices that can be generally deemed fair and reasonable business practice for all parties. The obligation to comply with the Helsinki Takeover Code is based on the provisions of the Finnish Securities Markets Act and the comply or explain –principle, which means that a party not committed to complying with the recommendations must provide an explanation for this.